Before I begin teaching you how to model with polygons I would like to go through a few things with you. This section isn't necessary you can skip right to Getting started if you want to get right into it. Polygon modeling is a very powerful technique and with today's technology a lot of animation houses are using it one way or the other beside using NURBS. I believe it is necessary to learn EVERY technique you can so when the time arises you can find the most effective way to tackle a project, this technique that seems so primitive and old is actually an extremely powerful method. Some of these people who use polygonal modeling are Steve Burke, Jesse Hayes, David Biggs. The primary reason that this technique hasn't been documented about in the past was that only a small amount of people (yet very talented people) were using it, and no one really explained what is required to use this technique or how it actually works. 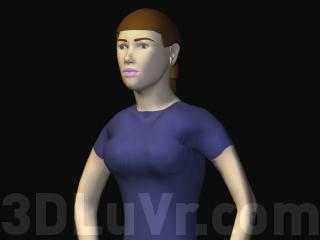 Ahead in this tutorial I will try to explain how to model a female using polygons. This technique is designed for intermediate to advanced users, though I do welcome all artists to try out this tutorial no matter how experienced. Though this tutorial is directed at 3DSMAX users it can be used with any program that has a smoothing technique such as Softimage and Maya.